Each of the five games was a shutout. Three of those, over a six-day span, were pitched and won by Christy Mathewson, a 25-year-old Giants hurler who established himself as a first-magnitude star in doing so. The opening game was a popped out, Mike Donlin singled to left, scoring Bresnahan and advancing Donlin to second. After Dan McGann walked, Sam Mertes doubled, bringing home Donlin. In the Athletics' half of the sixth, Ossee Schreckengost doubled, advanced to third on a wild pitch but did not score, and was the lone runner to reach third base against Mathewson in the entire Series. The Giants added an insurance run in the ninth, when Billy Gilbert scored on Bresnahan's single. This was the first of Mathewson's three complete game shutouts, a Series record that may never be matched. Christy Mathewson once again took the mound for the Giants in Game 3. Opposing him this time was Andy Coakley, who hit the first batter he faced, 1945 World Series, although Detroit, with Hank Greenberg and Hal Newhouser, ended up taking that Series four games to three. The Giants looked to wrap up the Series behind the perennial Christy Mathewson, who faced Chief Bender this time. 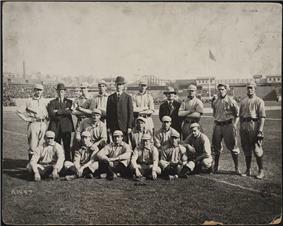 The game was scoreless until the bottom of the fifth, where Sam Mertes scored during a bizarre double play involving Bill Dahlen and Billy Gilbert. In the eighth, the Giants got an insurance run when Mathewson scored on George Browne's groundout after Roger Bresnahan's double had sent him to third with less than two out. Mathewson then took the mound for the top of the ninth and induced three groundouts, thereby completing arguably the single greatest performance by any player in World Series history with his third complete game shutout of the Series, which may never be duplicated. ^ "1905 World Series Game 1 - New York Giants vs. Philadelphia Athletics". Retrosheet. Retrieved September 13, 2009. 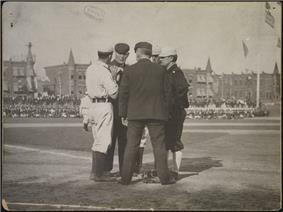 ^ "1905 World Series Game 2 - Philadelphia Athletics vs. New York Giants". Retrosheet. Retrieved September 13, 2009. ^ "1905 World Series Game 3 - New York Giants vs. Philadelphia Athletics". Retrosheet. Retrieved September 13, 2009. ^ "1905 World Series Game 4 - Philadelphia Athletics vs. New York Giants". Retrosheet. Retrieved September 13, 2009. ^ "1905 World Series Game 5 - Philadelphia Athletics vs. New York Giants". Retrosheet. Retrieved September 13, 2009. Cohen, Richard M.; Neft, David S. (1990). The World Series: Complete Play-By-Play of Every Game, 1903–1989. New York: St. Martin's Press. pp. 9–12. Reichler, Joseph (1982). The Baseball Encyclopedia (5th ed.). Macmillan Publishing. p. 2113.